To test how effective the DIY filter is, I’ve been posting lots of data on 2.5 micron particles. But my particle counter also measures smaller 0.5 micron particles, and I’ve been looking closely at that lately. Remember that the “PM 2.5” you hear in the news is different from the numbers on most particle counters. Laser particle counters count X particle size and above. Government machines estimate the weight (mass) of particles of X particle size and below. 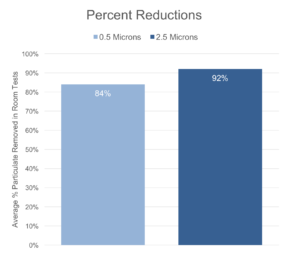 0.5 micron particles are tougher to get rid of, so how well does the DIY filter do? To answer that question, my collaborator Anna tested the DIY filter we’re shipping from Smart Air (now updated with the stronger DIY 1.1) on three different nights in her home. As with my most recent test, I calculated percent reduction compared to the room air before turning on the filter, rather than compared to outside air. This is a more rigorous and conservative way to calculate effectiveness than comparing reductions versus outside air. 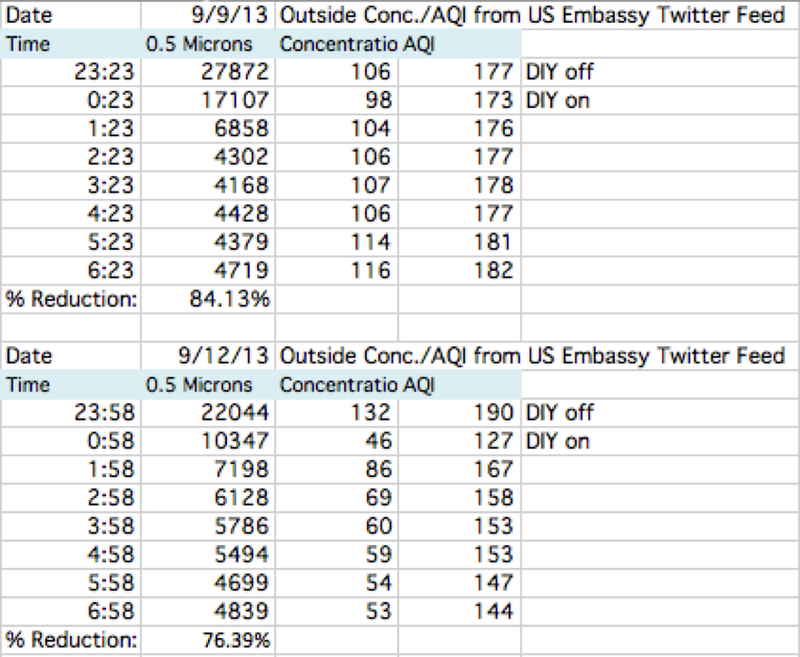 Conclusion: On average, the DIY filter got 92% of the 2.5 micron particles and 84% of the 0.5 micron particles. Although 0.5 micron particles are smaller and harder to catch, the DIY filter is still getting 84% of them. As always, I’m detailing my methods for data nerds below. Methods: For the DIY tests, we used the same HEPA and Meidi fan we’re shipping from Smart Air. As in the tests I reported earlier, my Smart Air collaborator Anna took a baseline measurement of her bedroom air with the Dylos “beast” particle counter, then she turned on the DIY filter and switched the particle counter to take hourly measurements. Anna took the baseline measurement before she went to bed, and she set the particle counter to take hourly measurements until she woke up in the morning. To calculate effectiveness, we averaged the 0.5 micron readings for the four hours prior to waking up, and calculated the percentage reduction from the baseline reading (before the DIY filter was turned on). As I’ve said before, I think this method of calculating effectiveness is more rigorous than calculating as reduction from outside because indoor air is cleaner than outdoor air. Anna’s room is 15 meters squared. The windows were closed at all times, and the bedroom door was mostly closed before Anna went to bed, and it was always closed during sleeping hours. If you look at the outside AQI, you’ll see that the first test (9/9) has the most stable outside AQI counts. Thus, that number is probably the most reliable. It also happens to be the average of the three numbers. How long does the DIY filter last? I’ve bought one from 3M but am not sure what to check to know when I need a new one. Hey Franz! 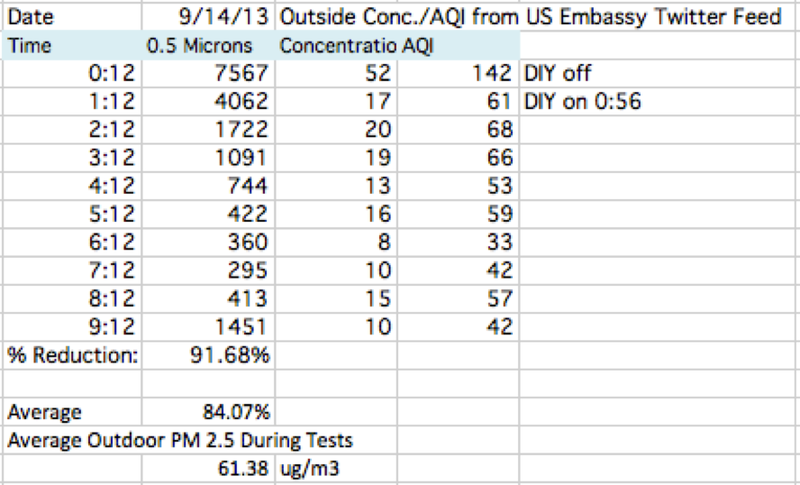 Based on the tests that we ran in a bedroom in Beijing, our DIY filters last 3-4 months. Check out the data on DIY filter lifespans here!